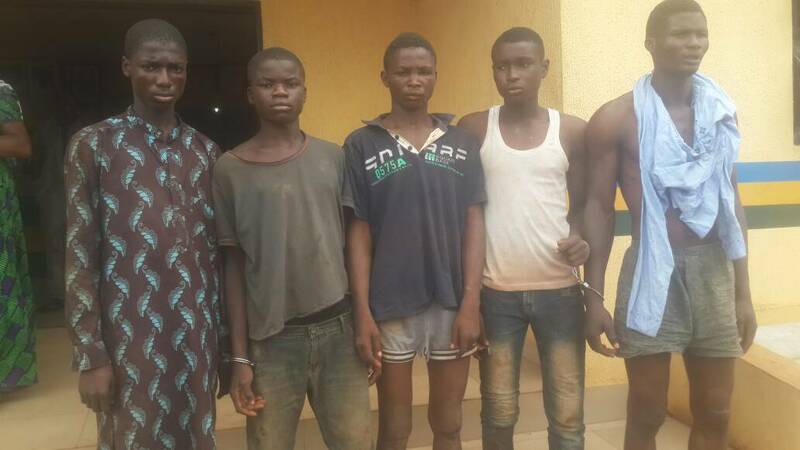 The Ogun State Police Command have arrested five men suspected over the murder of a popular hotelier, Chief Moses Akanni Famuyiwa. Chief Famuyiwa the Director of MAFLAND HOTEL was allegedly attacked by some hoodlums at the residence of one of his wives at Arigbajo in Ifo local government area of the State mid-June. Amiloaded gathered that the hoodlums numbering about eight broke into the residence at about 5:00 am and held everyone hostage. They were said to have over powered the 73-year old, stabbed him on his left hand before dispossessing him of his bag containing the sum of #500,000 cash and two GSM handsets. He wassaid to have been rushed to the hospital by people in the neighbourhood; but gave up the ghost on the way as a result of excess bleeding. In a swift reaction, the Ogun State Commissioner of Police, Cp Ahmed Iliyasu, ordered the DPO Ewekoro, Sp Vincent Egwuonu to get the hoodlums arrested within the shortest time. In compliance with the Cp’s order, the DPO and his men swung into action and through intelligence they were able to arrest the following suspects: Dare Abiodun ‘m’ 19yrs, Femi Ayinla ‘m’ 17yrs, Abduliamin Akinlotan ‘m’ 18yrs, Jamiu Akeweje ‘m’ 19yrs, and Gbenga Ojo ‘m’ 20yrs. They have all made confessional statements regarding their involvement in the murder of the deceased. However, the Cp has directed that the case be transferred to State Criminal Investigation and Intelligence Department for discrete investigation and possible prosecution of the suspects.